The patented Chia Growing Sponge is ideal for indoor herb gardens. The patented Chia Growing Sponge is ideal for indoor herb gardens. It provides just the right air-to-water ratio for fast germination and vigorous growth. Distinctive terra cotta pots add a richness to your hoM.D.ecor. Two bonus packets of seeds will allow you to plant your favorite gourmet mix. The patented Chia Growing Sponge makes growing herbs indoors clean, easy and fun. Easy to do and fun to grow! The herbs from your Chia Terra Cotta Herb Garden will be beautiful, fragrant and delicious. 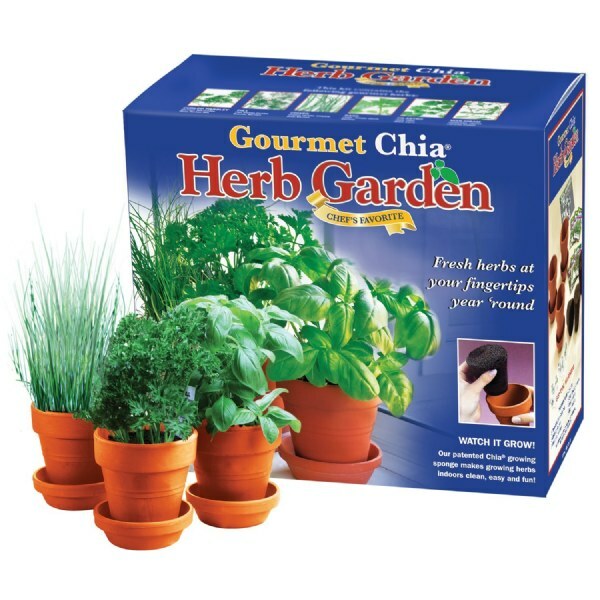 Everything you need to grow garden fresh herbs in your own home.